I took the small plastic vent cover off and cut the hole larger for a different louver. Start masking the section with tape and newspaper. The paint is dry ...see how it has a kind of GLOW to it. It's a smooth non- textured finish. The louvers were the final touch. 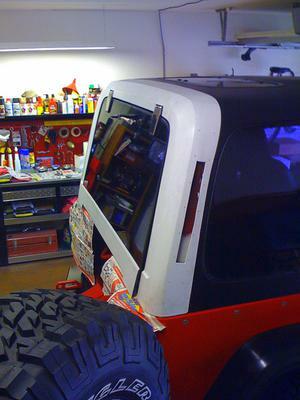 The OEM paint job on my Jeep YJ hardtop over the years had become faded and scratched. It also had a particle texture that I never really liked. To remove the old paint I bought a gallon can of a product called "Goof Off". This chemical is used to remove over-spray on originally painted surfaces without harming the original paint, but if you rub it in long enough it will eventually begin to remove the original paint. "Goof Off" has a thousand and one applications it can be used for and is much milder than using actual paint stripper. 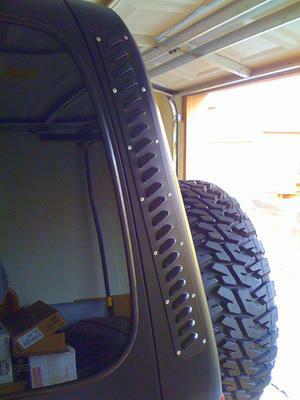 It's perfect to use when you're not removing your hard top from your Jeep. You'll need some shop rags and 3 pair of thick rubber chemical gloves. "Goof Off" will eventually eat through the finger tips. Once all the paint is removed the fiberglass of your roof will be smooth and shiny. I was kind of surprised to see that. Finish it off with a light sanding of 320 grit sandpaper. This is going to be a "rattle can" paint job. You'll need about 5 cans of Industrial spray paint in a Semi-Flat Finish. It's like a Hot Rod Flat Black (the finish is flat but has a "glow" to it). Industrial spray paint has twice the pigment and a tougher resilience to its finish than normal spray paint. 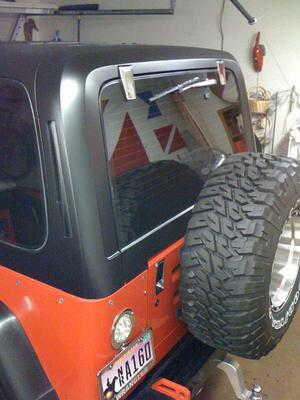 Your Hard Top was formed together with seams in 4 sections...top, 2 sides, and the rear section. This makes it very convenient to spray paint one section at a time. You'll need lots of wide masking tape and news paper. Also, cover all the surrounding area with old sheets to protect everything from over spray. Wear a painter's mask or use disposable surgical masks. The louvers were the final touch. I found these on a Nautical (boat) website. They were bare metal aluminum. I gave them a slight curve, drilled some holes, painted them with the same paint as the roof, and riveted them on. 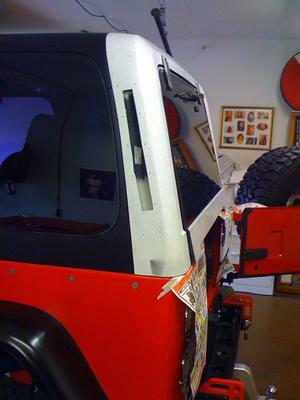 Editor's Comment: Your hardtop looks great.